Some time ago. I wrote a proposal for an active loudspeaker called the Convertible, using an 8″ woofer and a tweeter with a waveguide. Since then, I came up with the Mini Convertible (additional articles still in preparation) project, which is a more compact speaker. 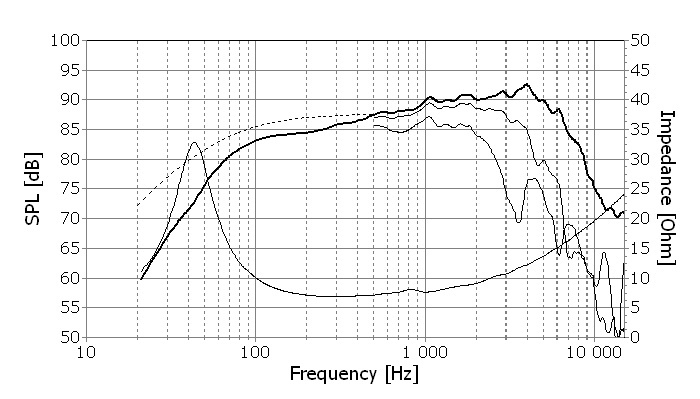 If you look at the dispersion shown by the 60-degree curves (orange in the top graph, bottom curve in the lower graph), the directivity of the woofer gradually increases above a few hundred Hz and then matches the waveguided tweeter around 2 kHz. It’s almost as if these two were designed for each other! The other thing about the U18 is that it has a nice little bit of extra Xmax, at 6 mm (peak). In fact, it has almost the same volume displacement as the U22 that I wanted to use in the original proposal. The net result is that I think two U18’s, while a bit more expensive, are a more effective solution than a single U22, for this speaker. And why not use two 8’s? Because the ported box would be too large. I’m quite excited by this design (at this concept stage anyway). Everything – size, output, plate amp power, etc – just all seems to fit together really well. But first, I’ll try to finish off the Mini Convertible series of articles, translating this same concept to the “mini” format. Did you complete the 2,5 way version of the convertible? The reason why I ask is that I am going down the same path. I am just about completing a build with the following parts: Scanspeak D2905/9900 tweeter and 2 pcs Scanspeak 18W8545K woofers. The lower woofer with a passive lowpass filter at around 300 Hz and second order (coil and capacitor). Plate amp is the Minidsp PWR-ICE250. The cabinets are original Magico V2’s. Bought from an auction related to the broke cabinet builder Hornslet Kabinetfabrik in Denmark. I am looking very much forward to testing – also because Minidsp has updated the plateamp with FIR possibilty (limited however). The reason why I write is to learn from your overall experience and the combination of dsp and passive x-over. MANY THANKS IN ADVANCE FOR YOUR KIND REPLY! !